﻿ Craftsman Square Balusters | Scotia Stairs Ltd. Size Choose an option36 in.42 in. 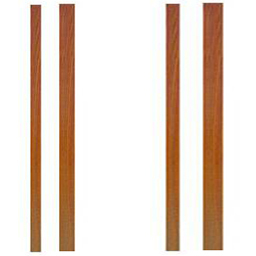 At Scotia Stairs Limited we supply Hardwood Square Balusters in 1-1/4 inch (standard) and 1-3/4 inch (oversized) profiles. The simple look that just keeps on staying is style! That is 100% what the Craftsman Collection Hardwood Square Balusters offer, full clean lines offering that contemporary look of modern components. The straight lines of the full square hardwood balusters and eased edges will please the eye and the touch. Shown below are examples of plain eased edge square balusters (chamfered and fluted balusters can be done also please call us for details). Please go to our Craftsman Newel Posts page to see the matching newels to Craftsman Hardwood Square Balusters.